This was posted earlier today by a British Imam who is visiting the region. I have heard of brutality and despotism in various parts of the world but Hasina, the current Prime Ministers of Bangladesh has broken all records. Hasina and her government committed genocide on Bangladeshi people yesterday. They have massacred countless men in the depth of the night.Hefazote Islam and its supporters gathered in Dhaka city with the aim of putting extra pressure on the government to end its brutality, human rights abuse, political abduction, extrajudicial execution, aiding and abetting the shahbag secular fundamentalists and thug rule. In response the government gave an ultimatum to the protesters to leave the city by dusk or the government will resort to its tried and tested method of clearing the city.I have heard of evil dictators attacking their own people but Hasina, an elected parliamentarian and the Prime Minister of one of the most populous Muslim nations in the world has stooped so low that even the evil dictators appear angelic. She massacred her own people while they slept. The protesters gathered in a square as the night fell and began to rest. Some asleep, some engaged in chit chat and some in personal prayers. At around 2.30am, while the protesters were resting and in the depth of the darkness that deepened over the city due to the government turning off the electricity from the entire area, the security forces moved in. What followed was a cold blooded massacre of the protesters. In the darkness all that could be heard are tanks rolling, machine guns firing and people’s last harrowing cries as the bullets pierced their bodies, leaving them dead or injured. 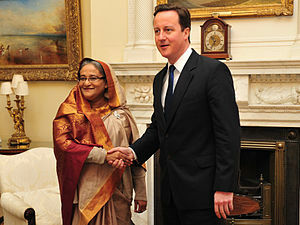 I have heard of Slobodan Milosevic’s mass murder and mass graves in Bosnia but Hasina has gone one step further. Her security forces have simply vanished the bodies of those they have massacred. No one knows how many people have been shot dead by the security services and nobody knows how many people have been injured either. The media organisations that are trusted by the masses of people have been shut down, the remaining media have been given clear instructions to not report or show dead or injured bodies. There has been a total shut down of press freedom and the world does not have a clue as to what unfolded in the Dhaka city last night. This was by the far the worst ever massacre of Bangladeshi people by any elected government.The current Awami League led government of Bangladesh is completely responsible for a premeditated and calculated slaughter of hundreds of Bangladeshi people. This government has orchestrated mass murder in the last 18 months at a scale that has not been witnessed in Bangladesh since the murders of thousands of Bangladeshis during the 1971 war. They have unashamedly silenced their opposition by taking their lives. This entry was posted in Foreign Affairs, Uncategorized and tagged Bangladesh, Hasina, Sheikh Hasina by Pamplemousse. Bookmark the permalink. There were incredibly violent protests throughout yesterday and well into the early morning. Many died, the highest estimates have this at around FORTY people, unfortunately (for us all and our bloody history) not the ‘worst ever massacre’ of Bangladeshi people by a long way. Pictures are not rapidly emerging that show a lot of the evidence of this massacre were photos lifted from other news stories, websites with gore, some even show men lying on the ground as ‘massacred corpses’ only to get up two minutes later, when the police offered him some water. The idea that 40 people died breaks my heart. The government are behaving disgustingly. I condemn their behaviour over the last few months and I think Bangladesh needs a political overhaul. They continue to blunder their way through this political situation whilst the opposition party arms their footsoliders- mostly young Madrassah students- with contemporary weaponry and the idea that they are ‘saving Islam’ rather than fighting for some rich families at the top. But lying about massacres of thousands won’t get us anywhere nearer to truth, or peace, or even a day without another strike that robs thousands of working families of their livelihoods. It will get us antagonism, tension, emotions soaring and, eventually, more deaths on all sides. I would ask Ajmal to think of this when plugging his agenda. I have no idea what is happening in Bangladesh but why does the left continuously support or make excuses for Islamist movements which are dedicated to overthrowing everything that the left espouses, ie secularism, womens rights, gay rights etc. Most if not all islamist movements are traditionally CIA backed and the Left seems happy to fall head over heels into the traps prepared for them by Islamist propagandists. I don’t approve of shooting demonstrators, buts that not a blank cheque to support anyone who wants to overthrow secular governments and replace them with medievalist theocracies. Thanks Brighton Belle. I think this stems from some kind of liberal guilt that Muslims are being oppressed (which they are, in horrific, inhumane ways) all over the world, especially after the ‘War on Terror’. The kind of bigotry we from the right wing, EDL, BNP and their American counterparts makes it understandable that Islamists would be sympathised with as a marginalised group. Indeed I’d agree that in many instances they are. But not here. The Islamist protest yesterday was funded by and supported with lots of melodramatic rhetoric from the main opposition party in Banglaesh, as well as the Jamaat-e-Islami, a political party listed by the CIA as terrorists, yet continually courted by the USA. It should be noted that no Islamist party in Bangladesh gains more than around 5% of the vote. This is not ‘popular opinion’. Many of those present were just Madrassah students there to speak out for their religion, but many had grenades, bombs and machine guns. The leader of this group, supposedly composed of the poor, needy, pious rural majority goes around in a private helicopter. This is not the rising of the oppressed. This is a power play between some of the richest, most influential families in Bangladesh that is decimating ordinary people. Riding around in helicopters, carrying bombs and grenades? You are just making stuff up, clearly you have an agenda – you would’nt be Hasnia by any chance? There are pictures appearing from local journalists that show hundreds of dead bodies at undisclosed sites with soldiers in Bangladeshi Military uniform standing by- open your eyes people. I am deeply upset and saddened that this devil Hasina can come to our country and broker deals for trade to help herself and her thugs, I pray that she meets a fitting end for her crimes against humanity. these are the gravest of times in Bangladesh. I call on those who love justice to pay attention to the coverup of this horrific slaughter by local civil society and media, who have blood on their hands for making the mood music for this. Also the BBC Bengali service has let down the tax payer as editor Sabir mustafa has suppressed the truth of the matter and ties a partisan government line. few are likely to care for the sons of poor men in Bangladesh, they do not deploy liberalism to gain urban stature and secure privaledge. ajmal masrur is a dedicated community worker and is raising the issue quite strongly as he has tasted what’s going on in Desh right now. concerned organisations need to dispatch investigation teams before the situation gets worse. and these teams need to talk to not just the government, and their friends in donor dependant NGOs but the victims, people are scared. democracy died that night and we have much to learn about it deapite the government and their useful idiots best efforts to erase the reality of the massacre. many serbs still hide misdeeds of the balkan wars 20 years on. you’re really a excellent webmaster. The website loading speed is incredible. It kind of feels that you are doing any unique trick. In addition, The contents are masterpiece. you’ve performed a excellent activity on this subject! I am no longer certain where you are getting your information, but great topic. I needs to spend some time studying much more or figuring out more. Thank you for great info I was looking for this info for my mission.